Lewis Mousley, one of the first missionaries to Bohemia, listened to the advice of a converted Catholic Priest and did what to teach the gospel? From the life of Robert Patrick: For about two years before hearing testimony borne to the restoration of the gospel in this age, he had been considerably exercised on religious matters, but could get no satisfaction from the teachings of any of the sects. He had been listening for some time to the preaching of an old Baptist who held forth on Glasgow Green, a place of common resort for purposes of religious and political discussion. He became convinced of the necessity of baptism by immersion, and his mind was gradually prepared for the reception of the gospel. One day the Baptist failed to fill his appointment and the youthful enquired was attracted to another place, where a crowd had collected. As he reached the spot, Robert Kirkwood, a “Mormon” Elder, had just concluded a discourse, and Ralph Rolly, another Elder, was bearing testimony that the gospel had been restored in all its ancient power by the ministration of holy angels and through the instrumentality of a Prophet named Joseph Smith. The words of the speaker electrified the young man and he felt certain they were true. The crowd pressed hard upon the Elders and threatened to throw them into the river. Robert Patrick buttoned his coat, stepped forward, and shouted with determination in every tone and gesture, “you shall not harm these men,” feeling at the same time that he would have fought for them to the death. A man named James Steele joined with him in protecting the Elders, and the two kept the crowd back until the missionaries could retire from the scene. On going home that night Robert was asked by his mother where he had been. 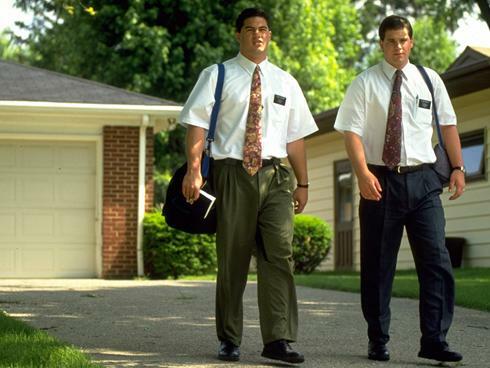 “To hear the Mormons,” he replied. “Who are they?” “They believe in Joe Smith,” he answered tactfully, hoping to forestall any trouble. As soon as he utter the last sentence he was seized with a sudden pang of remorse. He felt that he had done wrong in speaking disrespectfully of the Prophet and was humbled, sorrowful and ashamed. Soon afterwards he went to the house of a blind man named William Eccles to get something turned on his lathe. Eccles, in broad dialect, said: “Man, Robert, come an sit doon, and I’ll tell ye something far mair to your guid than a’ the turnin’ in the world.” This man preached the gospel to him night after night for three weeks, and in three months from the time of hearing Brother Rolly’s testimony, Robert was baptized. Andrew Jenson, L.D.S Biographical Encyclopedia (Salt Lake City: Publishers Press, 1901) Vol. 1, 681-682.